Hamilton High School one-act play performers will move on to state competition after advancing in both district and sectional competitions. Students will compete Nov. 17 at the University of Wisconsin-Whitewater campus. Students performed the one-act play “Selfies” by Bradley Hayward. It is about eight high school seniors’ journey through their senior year learning about life, death, love, hatred, fitting in, standing out, accepting others and themselves. Through it all they document their metamorphosis with an abundance of selfies. Students who perform in the production are: Kayleigh Winston, Ariel Hoefler, Ashley Bissen, Jonathan Costa, Dorothy Palmer, Kayla Kidman, Joseph Davila and Ashlin Hickling. The team also consists of a technical crew managing close to 200 technical cues. They are: Jasmyn Ware, Linsey Blattner, Krystal Fedie, Briana Taylor and Morgan Waldenberger. Linda Schuster Hake is the director and is assisted by technical director John Washbush. 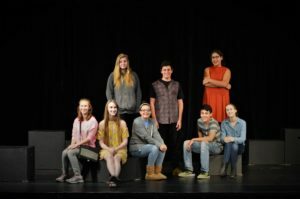 The One-Act festival is part of the Wisconsin High School Forensics Association Theater Festival (WHSTF). The WHSTF provides students and teachers with an opportunity to learn from trained theater professionals and educators, to take the stage and to watch peers perform.